Aluminum garden furniture include dining tables, patio chairs, park benches, outdoor fountains and bistros sets. 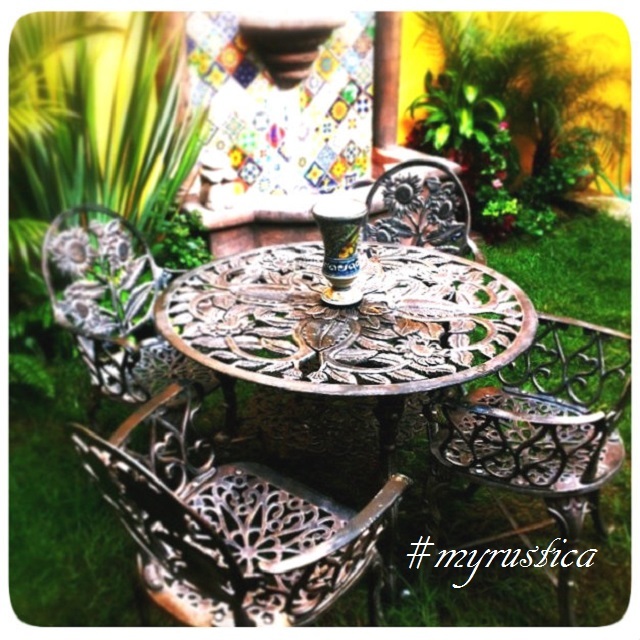 Rustica House garden furniture are handmade in Mexico using aluminum sand casting technique known to mankind since its beginnings. Aluminum furnishings are hand painted with rustic finishing. Usually, more than one color is used to create an old vintage furniture look. Rustic Garden Bench "Folk Art"
Rustic Garden Bench "Old European"
Rustic Garden Bench "Virgin of Guadalupe"
Rustic Garden Bistro Set "Colonial"
Rustic Garden Bistro Set "Mediterranean"
Rustic Garden Bistro Set "Spanish"
Rustic Garden Bistro Set "Traditional"
Rustic Garden Chair "Bouquet of Flowers"
Rustic Garden Chair "Bouquet of Roses"
Rustic Garden Chair "Folk Art"
Rustic Garden Chair "Michoacan Traditional"
Rustic Garden Chair "Old European"